Bionaire WF6000 Wick Filter is a Genuine OEM Bionaire Filter. Bionaire WF6000 Wick Filter fits BCM4509, BCM6100, BCM6200. 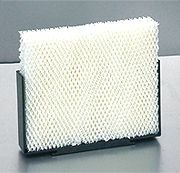 Bionaire WF6000 Wick Filter is used to produce moisture. Filter Dimensions, inch. 7.7 x 6.9 x 2.6. Bionaire WF6000M filter is a Wick Filter media only - no Frame. The existing frame can be re-used or the filter cann be used without the frame. Save up to 50% on Delivery Charges* when Order a Pack of 2 Bionaire WF6000M Wick Filters. WF6000 x 2 Bionaire WF6000M Wick Filter. Save up over 50% on Delivery Charges* when Order a Pack of 4 Bionaire WF6000M Wick Filters. WF6000M x 4 Bionaire WF6000M Wick Filter Media.